The election is just 5 days away and I am still at a loss. Not on who I will vote for but if I will vote at all. I have sat for weeks trying to find your policies that affect me, my friends and my family. I appreciate that you promise to strengthen medicaid and that your wife helps impoverished kids in war torn nations. I have read that one of you doesn't know the difference between Down Syndrome and Autism. That scares me. I read that the other wants to make sure the disabled get back to work and are integrated into society and accepted and able to get insurance that they will pay for. What about the deeply disabled? Not the ones who slipped at the grocery store but the accident victims or the genetically condemned? My daughter and so many children like her will not be able to work,read or write, or answer a phone. She can't sweep a floor or assemble toys. What about her? Will you make sure that she always has insurance ? What about her family of four who is forced to live on a 1 person income due to her 24 hours a day of care needed? How about Universal Care and Universal rights? Will you address the fact that some states provide for their disabled while others do not? Are you even aware that her mother cannot get a job because there is no way she could keep one with all of her daughters appointments and therapies and illnesses? Do you know that some states will pay one parent 40 hours a week to take care of their child while so many others don't? I do not think 40 hours, 8 hours a day, 5 days a week is too much to ask for a child or a person that takes care constantly. I'm talking about being fed every meal, given every drink, being bathed, carried, turned in their sleep because they are uncomfortable and not able to turn on their own when they get stuck. What about these people and their families? Are we sentenced to be poor just to keep their insurance and provide them proper loving care? Can someone please stand up and care for us and ours first before every other nation in the world? Can we provide universal care and universal rights for every person in every state? These are the issues that affect me and the people I love. I am an American and I count. This weekend Abby and I went to a Let's Do Tea Party for Rett Syndrome. Abby was a perfect angel the whole time. She is getting better with socializing out of her environment as long as their are people she knows and she is getting used to our Rett friends here finally. I have no idea how much money was raised but we got to spend time with our Shannon and Alysssa. We also got to meet a wonderful family from about 2 hours away. Their daughter name is Brenna and she was just diagnosed this month! She is 10 years old! I cannot imagine having to wait that long. They were incredible people. Brenna has CDKL5 as opposed to MECP2. CDKL5 can cause a host of issues, disorders and syndromes including Rett. Brenna was a tad nervous I think because she didn't know any of us and we were of course right in her face. 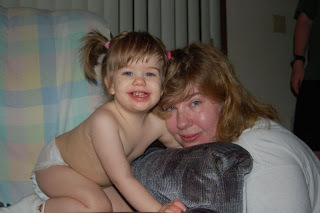 She was very sweet and definately a Mommy's girl! I do hope her family stays in touch. Here are some pics of the fun! Ok Brenna. You'll get used to it. They're good peeps! Two years ago today our world as we knew it and hoped for it came tumbling down. Two years ago today we went to the hospital to visit the Genetics scientist. We were under the impression we were going to give them a medical history and draw more blood. 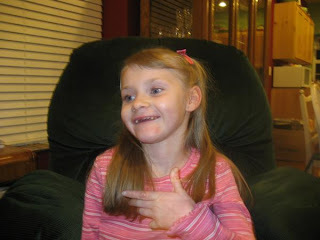 We knew she didn't have Rett Syndrome because the test had already come back negative. We knew they had sent it off to Houston to what they caled a backup deletion test but we didn't know what that was or what it meant. We calmly walked in and sat down. The Doctor came in and smiled at us and got out his notebook and started going though the history on both sides. All the normal history questions. Heart, lung,cancer,..........This lasted almost an hour. He then put down his notebook and said,"Well what we can tell you about Rett Syndrome is unfortunately not much......" He said more things but I stopped breathing and the room started spinning. I stopped him and told him that Abby didn't have Rett Syndrome because we had already taken the test. I just looked at him and said,"Did you just tell me my child has Rett Syndrome and just slipped it into conversation?" He looked at me and said,"No Mrs. Vejrosta. 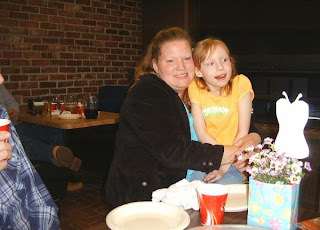 What I am telling you is that Abigail DOES have Rett Syndrome. I started to hyperventalate. The room went dark and I just shook and kept saying no, no, no over and over again. I looked over at my husband and his face was red and he was sliding out of his chair and shaking uncontrollably. He had gone into shock. I yelled at them to get somebody, to do something. They got him up on a table and gave him juice and I held him and told him it was ok and we were gonna do this. I told him she was still our baby and she was the same baby we had yesterday and the same baby we had this morning. By the time we got George on his feet there was several of the genetics doctors and nurses in the room. I remember looking at my daughter who was wobbling around the room and twisting her fingers and smiling. I looked at one of the doctors and said, 'What do we do?" She looked at me and said, "Take her home and make her comfortable." I thought she was gonna die. I was so sick. I just shook. I was more worried about my husband though. He was unconsolable. I went home with the website address they had given me and started to look up information. It did not make me feel any better. It made me feel horrible and empty. I started looking up online Rett Support Groups an finally found one. They welcomed me immediately and the very next day I heard from the Rett Syndrome Association rep in our area. Later that day we heard from Kathy Hunter the founder of the Rett Syndrome association. We talked to these ladies several times over the next week and they assured me that although it was horrible we could handle it. 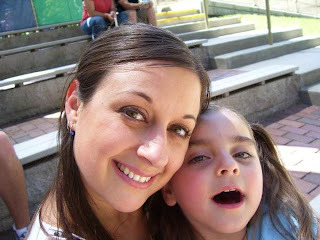 That Abby was still our baby and we were just going to have to choose to be happy and to learn how to dream new dreams. There are still days when I don't want to get out of bed. There are still nights when I cry myself to sleep. It usually hits after we have been around a girl her age and we see all that she can do. Or we meet a small child who has something horrible like Down Syndrome and watch him run circles around Abby and is able to communicate. Abby is very wobbly like a infant just learning to walk. She can't climb up or downstairs. She cannot pick up or hold anything or talk or used her hands. She will never gain these skills unless there is a cure. In the last two years we have met wonderful families in the same boat as us. They have become our family. I don't know what I would have done in the last two years without The Rettlanders, , Kelly and Carrie and the rest. Rett Syndrome Research Trust is looking for 3000 donors for 3000 drugs. RSRT has committed to testing every FDA-approved drug for efficacy in treating symptoms of Rett Syndrome. What is a large-scale drug screen, and why must it be undertaken? Clinical trials are the endpoint of a drug discovery process that takes 12 years and costs many hundreds of millions of dollars. A possible shortcut to this process is to identify existing drugs that have the ability to improve Rett symptoms.RSRT has therefore approved the careful and methodical screening of all 2000 FDA-approved drugs plus 1000 compounds. “Hits” (drugs or compounds showing improvements) will be immediately evaluated and fast-tracked directly to clinical trials. This is crucial work that is ready to go. We call out to every friend and family member of our daughter Abby to speed this project quickly towards completion by sponsoring a drug for $168. All of our girls afflicted with Rett Syndrome deserve a better future. Help us take an essential step forward! Can't help? Ask your company to make a contribution or pick up RSRT as one of their charities. We as Rett Syndrome families are commited to getting the word out because people can't help if they don't know! We are part of a "family challenge" to see how many drugs we can get sponsored in Abby's name; so we are excited to see what happens! We get notified of each sponsorship so I will let everyone know how we are doing along the way!!!! Thank you for making a difference in Abby's life and in the lives of thousands of little girls suffering just like her! Yesterday afternoon we had a scheduled parent teacher conference at home. I am so glad I scheduled it at home where her teachers and therapists could see Abby in her own environment. Abby has been sick lately so she had spent most of the day curled up on the couch with The Wiggles. When her teachers walked in she looked kind of confused-as I think all children do when they realize their teachers dont live at the school and sleep under the desk. As everyone I arrived-both teachers, her OT, nurse and PT she wanted off the couch and she just walked around showing them her toys and her fish in the aquarium. It was very comfortable. They got to see her do stuff they were not aware she could do like finding her drink on her own and drinking and standing from a sitting position on the couch. I was very happy to hear that she is really adapting to the switches at school and that the whole class really loves to help her. Two of the kids in particular are very helpful and protective. One of them is the peer model. I had been real upset the last few days with her being so sick I was seeing less and less from her and I was pulling my hair out over a promised fundraiser that it seems will never happen and that I have to jump through a thousand hoopes everytime we need something for her. The latest was trying to get a communicator for her at home but the therapist told me they will help with the paperwork and writing letters so I really do feel like I can breath a little. I am so glad to finally get some help. I wish I would of taken some pics of them here. You could really see how much they love her. And her sitting on the nurses lap and cuddling really brought tears to my eyes. Seriously, in all my efforts not one person has donated one dollar towards treatment for Abby and our girls. I do want you to know that money donated goes to labs, doctors, medicines and research not our pockets. You can make a one time or recurring donation. All donations are tax deductible! I have included a few interesting pieces of info for you. WASHINGTON (Reuters) - Scientists searching for a way to treat the rare but severe childhood neurological disorder Rett syndrome have reversed the disease in mice, raising hopes for doing the same in people. In a study appearing on Thursday in the journal Science, researchers led by Adrian Bird of the University of Edinburgh in Scotland switched on a gene called MECP2 in mice with the equivalent of Rett syndrome to make their symptoms vanish. The surprising results contradicted the notion that damage to the brain caused by the disease, which occurs nearly exclusively in girls, is permanent. "It rocked us back on our heels because in a way we were expecting a more disappointing result," Bird said in an interview. 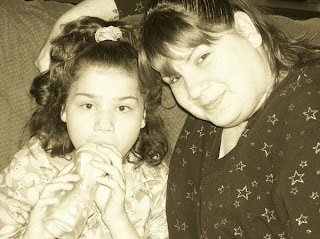 About one in every 10,000 to 15,000 girls born have Rett syndrome, which affects all racial and ethnic groups worldwide, according to the U.S. National Institutes of Health. In their first six to 18 months of life, the children develop apparently normally before the onset of devastating symptoms. Children with Rett syndrome commonly show autistic-like behaviors in the early stages. It destroys speech, normal movement and functional hand use, and causes breathing difficulties, susceptibility to epileptic fits and tremors like those in Parkinson's disease. Many patients are confined to wheelchairs. Those who can walk do so with an abnormal, stiff-legged gait. A few Rett Syndrome facts:Debilitating neurological disorder that predominantly affects females. Another little girl is born with Rett Syndrome every 90 minutes . We just got back from the doctor for her prescheduled well check. And this came up:You knowAbby had a virus over the weekend. A high one 103 and above. While she was very feverous(sp) she would grab things and hold them and hand them back to me. I talked to her doctor about it this morning and he wanted me to ask if you guys have ever seen this with your girls when they are sick? Abby usually has no hand function other than slapping. He also brought up the gtube because Abby has only gained one pound since her diagnosis 2 years ago. He wants us to document everything she eats and doesnt eat for two months. If she hasnt gained any weight he wants us to go ahead with a mickey. Her throat is still red but the ulcers are gone. We decided to keep her home from school today to get more rest. Thanks so much for all your well wishes. I really appreciate them. We took Abby to the hospital tonight. She has an ear infection and a sore throat. They did a rapid strep test because her throat is really red and has ulcers and pus pockets but it came back negative. They wouldn't give her anything for her fever because I had given her tylenol before we left the house. When we got home her fever was back up to 103.4. She is still refusing food and very lethargic and whimpering. She is taking some pediasure but only through a medicine dropper. Like a little baby kitten. Let's hope Miss Princess doesn't get too used to that! I almost flew over the counter at the check in nurse. I told her Abby was non verbal, has Rett Syndrome and that I had already spoken to the doc and he wanted them to check her ears and throat and she asked me if she had been complaining that her throat hurts. I repeated that she is non verbal and she said, and I quote,"Is she always non verbal?" Update:530 am 104.2 coughing. Very upset. I have medicated her and am waiting to see if fever goes down. We havent been able to get her to eat more than a few bites today. She layed down on her own-which never happens and woke up with 103 fever. She isn't even taking her pediasure. SHe is very lethargic. Keep her in your thoughts please. Abby got presents from Kelly and Brooklyn and Gail and Seaira this week and she loves them! Kelly and Brooklyn sent her lots of stuff but her favorite is this Girl Power 2 Cure Kitty. Oh she loves her Kitty! I love seeing her happy. She has been a grumpy grump with a cough lately but these sure cheer her up. Thanks girls!!!! to donate to research in Abby's name! We took Abby to Childrens Hospital this morning to get her new braces and she thinks she's pretty hot stuff. She took right off in them. These ones have deep padding on both sides of her ankle. Way more support we think. Waiting for her wiggles. Feet much straighter Look how good I'm walking!!!!!!! This is the new brace!. Lovin it! We took Abby to her great grandparents farm this weekend. We had a wonderful time. We hadn't taken her down there since she was in the throws of regression. At first it was because of our depression then it was because we were afraid it would be too hard on my grandparents who simply adored her. They are great folks who have lived in the same few square miles that their grandparents settled on from Germany a long time ago. They have 240 acres that a local farmer now farms. The ride down was peaceful and she was an angel the whole ride there and back-almost 300 miles. Here she is kissing great grandma. She charmed her socks off!!! They were so great with her. Grandma gets denied! So funny! It is October. I noticed today on the way to pick up Abby's wheelchair that all the fountains in town were pink. Pink for Breast Cancer Awareness Month.It is also Rett Syndrome Awareness Month! This year, I am trying to make it “Action Month” as well. Since you are “aware” of Rett Syndrome, I am asking you to help me take action.As you know, our daughter, Abby, has Rett syndrome. This devastating disease has taken away her ability to move at will, all purposeful hand use and the ability to speak.. She is our world and in the Rett Syndrome World you learn very quickly that the friends and families of these girls are the only ones who speak for them. Funds are not raised in drive throughs or at stores and we have no telethon. All we have is each other and word of mouth. In honor of Abby, I am joining the non-profit organization Girl Power 2 Cure to help fund Rett Syndrome research. www.girlpower2cure.org/abby and click the “donate” button. To really make an impact, also consider sponsoring a drug in honor ofAbby. There is a crucial project needing funding which will test all 3,000 pre-approved FDA drugs. There could be help for Abby on the shelf just waiting! One drug costs just $168 to test. Click the link on our family page, or go directly to: www.rsrt.org/news/Sponsor-a-Drug.html to sponsor a drug now. Abby thanks you. Hopefully one day she will say it! Abby's 4th birthday was last Friday the 26th. I can't believe she is 4 years old. Most people that were invited came and there were a few that had RSVP"S then didn't show. That's ok cause I ate their guacomole and their cake! We put Abby in a halloween costume as we do every year but it didn't quite work out this time. For her 1st birthday she came as a fairy. For her second she was in traditional Czech garb that we made from a raggedy ann dress. Last year she had a purple velvet princess dress and crown. This year we apparently tried to dress her as the itchy dress princess so we changed into a tshirt and shorts before most of the people got there. We actually had some children there this time. I am noticing that Abby has nervous issues with typical children but doesn't seem to have any issues with special kids or babies. She spent the majority of the party in my lap except when she was conning cake off her Dad or Aunt Audra. I'm pretty sure she had 3 pieces. I was so pleased at the thought people put into her gifts this year. Books, videos, diaper pads, push button musical toys, things for her room. 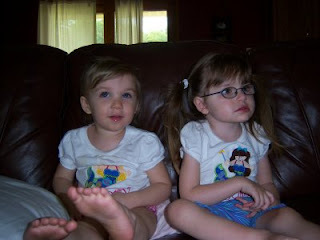 Scientist are on the breakthrough for a cure for our girls and any help would be greately appreciated. As most of you know my Abby was born a typical child and met all of her typical milestones except for sitting up and walking late which we attributed to being spoiled. At 18 months she woke up one morning blank as can be and no longer had func ional use of her hands and seemed to have forgotten how to speak and everything she had learned. After many months of doctors and tests we learned our baby had this horrible Syndrome.There is a cure within our reach ! All the girls above are also Rett Syndrome Angels.